The US Air Force is planning on making bat planes. Yes, these future guardians of the sky will have technology based on the physical attributes of bats. They plan to make compact and maneuverable aerial vehicles. Engineer Kenneth Breuer and biologist Sharon Swartz have teamed up in the project to take high-resolution 3D videos of flying bats in a wind chamber to see how they slip through air. 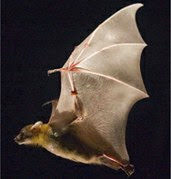 The scientists discovered that bats can be far nimbler and maneuverable than birds or insects. This is most likely because "a bat’s wings are thin and have flexible membranes interwoven with highly articulated muscles and joints that adjust both lift and drag in many ways." The study would justify Batman's preference for bat-designs on his jet.